Moving materials from one place to another with pressure, requires careful consideration of the media being pumped, distance, lift, size of pipe or hose being used, rate of flow required, and many other factors to select the right pump for the job. Garrett Industrial Systems offer pumping solutions made up of different styles of pumps from several different manufacturers, to meet the critical needs of the project. Providing the right mixer or agitator to meet the application, process, or need is something we have been doing for over thirty years. Garrett Industrial Systems can provide many different types of blending, mixing, or agitation solutions for most any application. The reliability of Wright’s TRA® 400 centrifugal design has been proven successful over many decades. Its robust design coupled with high quality materials of construction, make it the right choice for both high purity and ultra-hygienic fluid transfer applications. 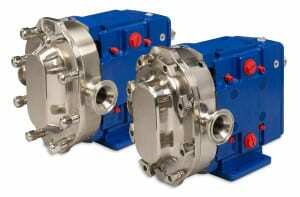 These pumps set a new standard with patented innovations such as internal seal flushing and true ZERO DEAD-LEG casing drains. Typical applications include water for injection (WFI), RO, DI, USP, process water, and non-shear sensitive products requiring the highest hygienic control and compendial water recirculation. TRA 500 SeriesTM centrifugal pumps by Top-Line, provide processors with lower cost of ownership due to its ease of installation, ease of maintenance, reduced downtime and lower cost/need for parts inventory. 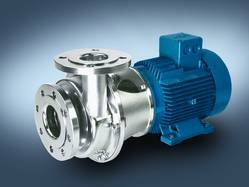 This series of pumps meet the most stringent hygienic standards for CIP and SIP. Typical applications include process water for pharmaceuticals and biotech (RO, DI, Analytical), personal care items (mouthwash, cologne, sanitizers), cosmetics and other personal care products. 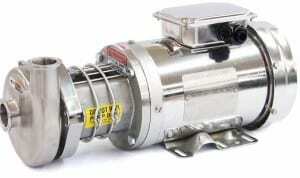 Top-Line offers a complete capacity range of rotary lobe-style pumps. Standard construction is 316L stainless steel wetted components with internal finish to 32Ra. Options include seal materials, seal flushes, jacketed front covers, integral pressure relief valves, large selection of end connections, FDA-approved elastomers, and improved internal finishes. The newly developed Series MKP-Bio offers you an excellent solution for aseptic applications for sanitary processes. The pump has been developed and designed according to EHEDG recommendations and complies with VDMA-24432 and EN-12462 standards. Please contact us at Garrett Industrial Systems for complete information and pump selection assistance for your applications. 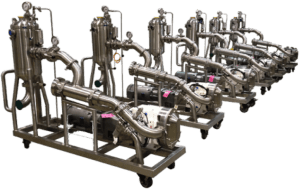 Garrett Industrial Systems, LLC offers a wide array of mixers, agitators, blenders and equipment designed to meet the most critical applications, whether it is mixing or blending high-purity chemicals, pharmaceutical compounds, food and beverage products, industrial powders, paint, or petroleum products. Each mixer is designed and manufactured for your application using only the highest quality components engineered specifically for years of dependable service. Our mixing and agitation products offer extremely high pumping rates for cost-effective, low volume mixing applications such as flash mixing in water treatment or dissolving salts in liquids. Industrial motors in standard frame sizes, rugged cast iron gearboxes with hardened steel gears and anti-friction bearings are all offered as standard equipment. We offer low horsepower turbine mixers, low-profile top, bottom, and side-entry mixers, ribbon blenders, static mixing columns, scraper-blade mixers for blending food products, paddle blenders for sanitary products, heated and high-pressure blenders, etc., all approved by USDA, FDA, ASME, etc. We also offer slow RPM Clarifier rakes for water treatment applications. Our portable mixers are built to last and designed to handle tough mixing applications such as lime makedown, polymer, and flakeboard particles. 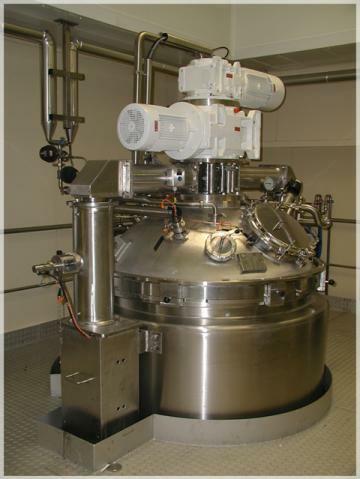 Our 3-D Series of mixers are used to disperse, agitate, and emulsify. We combine high shear dispersion and superior pumping to produce fast process times and energy savings of up to 50% over conventional dispersers. Our high flow impeller system quickly dissipates heat buildup, which is a serious problem caused by conventional high shear mixers in food and pharmaceutical products. Garrett offers static mixers in various helix configurations to maximize processing of various fluids. Static mixers and agitators are designed to blend, disperse, react, or shear two or more fluids within a short length of piping. Static mixers rely wholly upon the principle of flow constriction, radial eddying, flow division, and shear reversal. These transport phenomena combine to eliminate concentration, velocity, and thermal gradients. Garrett Industrial Systems provides CIP Pump Carts manufactured by IPEC, which are used for a variety of processing and cleaning operations where stationary units are not optimal. Utilizing a single cart in place of many dedicated pumps can significantly reduce capital and maintenance costs. Our engineers work with the customer to specify the proper pump style / configuration and any additional components, instrumentation, or integrated controls required for operation.